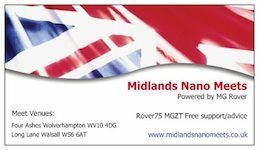 Forums » Technical Help for Rover 75 and MG ZT » 75 and ZT Technical help for all derivatives » Did I do something wrong....? 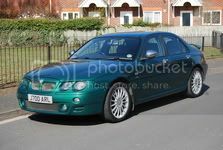 Rover 75, 04 plate diesel saloon BMW 2.0L engine. Day 1. Mobile Air Con guy turns up, gasses up aircon. Air con works, then cuts out. Guy tells me its because its overheated, because the Rad Fan isnt turning. He tells me 90% of the time its either the fan or the 100W gold resistor burnt out. Day 3. Determine the fan is ok, but the resistor is open circuit, replace it, reassemble. Works when ignition turned on and demist buttion pressed, as it should. Reassemble front of car. Go to start engine to allow it to idle to ensure correct fan and air con function....nothing. Click click click. Turn lights on, turn windscreen wipers on, try and start car, everything dims and slows slightly. Inconclusive. CAN (Bus Controller Area Network) /OBD (On Board Diagnostics) reader reports nothing wrong. Mate has super duper battery diagnostic device, made by those of Nipponese ethnicity, marvellous device, it determines Battery has suddenly kicked the bucket, it is no more, it is an ex battery. Replace battery, starts ok, charging ok. Still ok today, a week later. Solved. Now was this coincidence the battery died, or did I cause the battery to flatten somehow? Nothing was left on, no lights, or anything in the car. Just seems a bit weird it died suddenly, and after fiddling with the car, and leaving lighting plugs unplugged for two days. oldfart wrote: Or am I being paranoid? Possibly.... but probably nothing to do with the car or battery. Batteries can just fail - I've had a couple do that for no reason. Im not paranoid. I have mononoia - i think only one person is out to get me. Srsly. In the past, u can tell when a battery is failing, the car gets harder and harder to start, and if u turn on the lights and wipers, and crank it, the lights will dim and the washers stop or stall. This did neither. It went from good to dead in 48 hours, just sitting their. As I said, I have had a couple of batteries fail for no apparent reason. Parked my diesel 75 tourer up at work and then popped out to move the car a couple of hours later and nothing, dead battery. Earlier car had started without any issues, battery was probably 4 years old just gave up in the space of a couple of hours. Put it on charge at work, having tested the fluids and wouldn't take a charge, it had given up. When we had a 200 coupe, my wife came back from work and parked up and in the morning battery was dead. Charged it up and it lasted another day before giving up. Put a new battery on it and it was still working 6 months later when we sold it. I have noticed that modern batteries seem to fail with very little notice, although they do seem more long lived than in the past. Batteries from the sixties, seventies and eighties seemed to start a long slow decline from near new. Like you say, rather than a gentle curve downwards they now just drop off a cliff edge within hours. The other thing is the way the onboard computer now complains when you do anything, and disconnecting the battery requires nerves of steel, you just dont know WHAT is going to happen when you power back up. In the old days the worst that could happen was you had to reenter the radio code. 40 years at the practical end of IT taught me Occams Razor - the simplest solution is the best, the simplests explanation is the most likely. Look at the old Mk 2 Sierras, for example, back in the 80's - they had the old reliable, simple, 2.0L Pinto engine, you could fix anything on them with literally and handful of tools from Halfords. The greatest tribute o the fixability of the Sierra was when my mates girlfriend broke down at a motorway services in his Sierra, he got her to change the head gasket with the tools in the boot, talking her thru it over the phone, she got home ok. She was an amazing girl, but it was such a simple car to fix. You could set the points timing by ear - you just found the two extreme points rotating the distributor where it started to cough, took it back to the middle point then three degrees before TDC was about 1/8" left rotation from that point. You just listened to the engine, they were never too fussy. Theres alomost nothing on a modern car you can fiddle with, nothing to adjust, unless you have a laptop plugged into it, and the right software. You'll be lucky to get more than 5 years from even a quality modern battery, so when they fail, just buy another one and move on! Interesting observations. Factory installed battery lasted 11 years on my ZT. Did the standard falling off a cliff act as with most modern cars. As soon as the battery produces less than the optimum voltage the car will not start. However the battery would still be able to start an old vehicle albeit with reduced cranking power. Long live the current (excuse the pun) installed Bosch battery. Got a cheapy Lion Batt on wifeys Zr . only about 1 years into a 3yr warranty, went flat for no reason ? had it tested at my local garage, seems it was not very good under load.. took it back to ECP who tested it again with a different device and their result was 64% efficiency, and would not change it as it has to under 60% . To be fair its been alright ever since, but keeping an eye on it ..
Well at least you still have warranty for another 2 years, Steve had a battery from ECP which was under warranty and going flat if unused for a few days , we went down the route of looking for what may be drawing from the battery before we took it back to ECP when it tested fine ( not unsure of % ) , they were reluctant to change it but in the end did and the replacement was fine with no starting issues if left for a few days. Faulty testers nearly caused my cateract surgery be postponed. One blood pressure machine said my blood pressure was to high to proceed with the procedure. Another machine was then used and everything was OK.